See below a selection of our Used Euro Six minibuses. 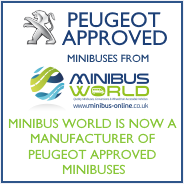 Alternatively please follow the link to see a selection of our new minibuses all of which are Euro 6 compliant. Not only do Minibus World buy and sell new and used minibuses but we are also a second stage motor vehicle manufacturer. We are also quite unique in our sector in that we not only supply off-the-shelf solutions to your transport requirements but we also can adapt existing used minibuses if they don't quite meet your requirements and also can build on Used Euro Six vans to create a unique product that fulfils your exact minibus requirements. Follow the link to learn more about our used minibus offering in general to see how we can supply your next used Euro 6 minibus.